I am having a very hard time dealing with my mother's personality issues. As an adult after a lifetime of dealing with it, I have resentments and little patience. After visiting with her, I am upset for days thinking of her little digging comments and arrogant disclosures about her wonderful self. I just don't know what to do because it is not good for me to hold in all of this anger and if I try to discuss this with her -its "all me" and (according to her) I have problems getting along with everyone and she should sell her house in this state, blah, blah. Who wouldn't become an angry person after a lifetime of being corrected by her, especially in front of others. She is rude, constantly interrupts (I can never even finish one sentence)she always gives her unsolicited opinions, even when she is not a part of the conversation, just listening in. After becoming an alcoholic (now sober for 12 and a half years), I know drugs and alcohol is not the answer but it takes me days to unwind after being with her. Everyone else has problems with her but they mostly ignore it but because as a child and now adult I was often the object of her rage and outbursts, I have a very hard time when interacting with her. 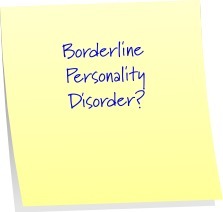 The borderline personality disorder is my diagnosis because those are the defining characteristics she has. Her behavior as a mother to me is so weird it is almost like an OFFICE episode. Videos that she has taken when I step into the picture I have heard her on the recording say, "you are going to get in the film" (like that is a bad thing or when my daughter got on the bus for the first day of school my mom was filming but as I was walking back up the driveway she took the camera off me and continued talking to me. She is much too big of an electronics fan for this behavior to be an accident. What mother acts like that? I zoom in on my girls and support them everyway possible. My mom will start screaming at me when she is "debating" some subject and she is never wrong. I have prayed for this lifelong hostility to end but it never does.